Once the development plan is in place and appropriate policies and procedures are set up, it's time to actively solicit gifts from donors and prospects. In this module, a closer look will be taken at solicitation strategies for campaign types, focusing most closely on solicitation techniques for annual giving. Additionally, there will be an overview of techniques for soliciting major and planned gifts. Special emphasis will be placed on implementing critical acknowledgement, acceptance, and recognition practices. • Describe solicitation techniques used in annual giving programs. • Name the additional training needs for volunteers involved in solicitation. • Discuss the six steps to a "model" major-gift solicitation. • List strategies for obtaining support from corporations/businesses, foundations, and government entities. • Describe the process for developing and presenting a written grant proposal. • Discuss application of appropriate acknowledgement, acceptance, and recognition policies and practices. As Founder and President of Pranger Philanthropic, Jill brings 30 years of professional fundraising and not-for-profit management experience to partner with organizations to enhance their fundraising programs and engage volunteers throughout the process. As an AFP Master Teacher, she is an internationally sought-after trainer and keynote presenter in the areas of fundraising, the not-for-profit sector, organizational management and development, philanthropy, business networking, and working with volunteers. Jill also serves as a part-time Lecturer in the MBA program at the University of Tennessee. Jill is a Board member for ACFRE Professional Certification and the AFP Foundation for Philanthropy, and former Board member for AFP International, AFP Genesee Valley Chapter, and AFP Smoky Mountain Chapter. As well, Jill has served on the Boards and Chaired numerous not-for-profit organizations. Jill also continues her 36-year volunteer career with the American Red Cross as a CPR/First Aid Instructor Trainer and Water Safety Instructor. In her spare time, Jill teaches Yoga, golfs, bikes, hikes, and sews. "Legal Requirements and Best Practices"
Presented by James L. Catanzaro, Jr., attorney with Chambliss, Bahner & Stophel, P.C. About the presentation: This session will cover state registration requirements for charitable solicitations, address best practices for charitable organization governance (in light of Form 990 questions), and provide a legal update on charitable giving. About the speaker: James L. Catanzaro, Jr. is a member of Chambliss, Bahner & Stophel, P.C.’s Health Care and Business Sections and focuses his practice in the areas of counseling physicians groups, mental health facilities, hospitals and other health care providers, as well as handling a wide variety of business matters, from contract negotiations to transactional and regulatory issues. He has published and presented on topics ranging from Medicare Part D and Health Care Reform to effective governance and board member obligations. Fundraising just wouldn't be possible without dedicated volunteers supporting the organization's efforts. Establishing and maintaining a respectful relationship with volunteers is both art and science, beginning with how they are recruited. This module will explore effective ways volunteers can be recruited, trained, managed, motivated, evaluated, and recognized. As importantly, there are times when volunteers are best included in the development process to ensure they experience a sense of ownership in the organization's work and can effectively perform their roles. • Explain ways to use volunteers to help achieve organizational and fundraising objectives. • Describe a model volunteer orientation program. • Explain the board's role in fundraising. • Describe methods for recognizing volunteers. Sandy Rees is a fundraising coach and consultant with a passion for showing small nonprofit organizations how to raise more money, strengthen their Boards, and build relationships with donors. She is an author and has written multiple books and learning products. Sandy is an accomplished presenter and an AFP Master Trainer. She has led fundraising seminars for local, regional, national, and international audiences, including New Zealand, Russia, and Jamaica. Fundraising is about more than soliciting donors and prospects, and the development office is responsible for managing the development plan. This module will present an overview of the management aspects of fundraising including budgeting, records management, gift processing, program evaluation, and the key roles and responsibilities of staff and volunteer leadership. The module ends with a look at accountability, basic legal requirements, and fundraising ethics in practice. • Participate appropriately in the organization's budget and planning process. • Describe key considerations in receiving, accepting, recording, acknowledging, tracking, and reporting gifts and pledges. • List the primary roles and responsibilities of the board, CEO and development officer. • Discuss methods for evaluating development program performance. • Identify basic accounting and tax requirements that apply to gifts and pledges. potential sources for this information. Nationally and internationally recognized as a high-content and entertaining presenter, keynote speaker and workshop leader, Marcy Heim's sessions focus on major gift relationship building, creating a mindset for success, leadership and staff partnerships, staff and volunteer major gift motivation and coaching, and long-term visioning. She is author of Empowering Your Board to Serve as Effective Development Ambassadors and is soon to release her second book, Strengthening your C.O.R.E. in Advancement. Marcy’s teaching is backed by over 20 years of firsthand experience as senior director at the University of Wisconsin Foundation, where she managed constituency development staff and programs for a college unit with more than 600 faculty and staff, 3,000 students and 40,000 alumni. Her unit experienced twenty-fold giving growth and completed a $50 million campaign under her leadership. In addition, Marcy coordinated the regional development efforts for the UW-Madison in the Pacific Northwest for 10 years throughout the UW’s successful $1.8 billion campaign. About the speaker: Nationally and internationally recognized as a high-content and entertaining presenter, keynote speaker and workshop leader, Marcy Heim's sessions focus on major gift relationship building, creating a mindset for success, leadership and staff partnerships, staff and volunteer major gift motivation and coaching, and long-term visioning. She is author of Empowering Your Board to Serve as Effective Development Ambassadors and is soon to release her second book, Strengthening your C.O.R.E. in Advancement. Marcy’s teaching is backed by over 20 years of firsthand experience as senior director at the University of Wisconsin Foundation, where she managed constituency development staff and programs for a college unit with more than 600 faculty and staff, 3,000 students and 40,000 alumni. Her unit experienced twenty-fold giving growth and completed a $50 million campaign under her leadership. In addition, Marcy coordinated the regional development efforts for the UW-Madison in the Pacific Northwest for 10 years throughout the UW’s successful $1.8 billion campaign. In April, AFP will feature a special two part educational session with Michelle Thompson. In session 1, starting at 11 a.m., Michelle will discuss "Hiring (and Firing) Volunteers", as well as other aspects of general volunteer management. Michelle brings her love of organization and unending pragmatism to each project she's involved in. Whether planning a complex event, talking one-on-one with a client in need of a solution or speaking to an audience of hundreds, Michelle uses her down-to-earth problem solving skills to cut through the clutter and streamline communications. Michelle founded Peacock Events in 2004 to provide a straightforward and strategic solution to event planning. Today, Peacock Events has expanded to provide consulting services and event industry education across the country. Her company works with architects to inform design of event spaces, non-profit organizations to develop systematic planning processes and corporate entities to strategically design and schedule events to maximize resources and achieve financial goals. Description: This interactive presentation will lay out manageable steps for moving from database management to database marketing. We'll cover what to put in and what to pull out of your databse and map out action plans based on real-life scenarios. Also, you'll take away the nine questions that will jump-start your database analysis. Re-charge your fundraising through creative, insightful analysis! Speaker Bio: Janey C. Emery, CFRE is a seasoned, nonprofit executive with proven track record of success securing six and seven figure gifts from a broad-based constituency. Janet has nearly 30 years of development experience in the arts, education, healthcare and human services. Janet is recognized for her ability to work collaboratively with grass roots groups, community volunteers and corporate executives. Round Table Discussion and Networking- Share best practices and learn from our area's professionals! Participants can choose three "mini-session", each lasting about 20 minutes. "Debunking the Myths and Simplifying Your PG Program"
Description: A discussion on building "Stepping Stones" to a successful donor-centered planned giving program which incorporates the complete planned giving process. Development professionals are often a bit reluctant to get into the conversation about a donor's estate plan. This presentation/discussion will help to put aside some of the more common misgivings that many of us have about planned giving. We will also discuss the ways that even the smallest of nonprofits can incorporate a planned giving program into their repertoire. 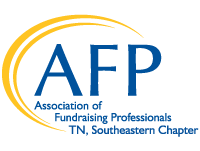 Meeting will feature Pete Cooper of the Community Foundation of Greater Chattanooga on the topic of “Engaging Donors”. Hear from one of our community’s leading fundraisers (and this year’s recipient of the “Nonprofit Professional of the Year” Award at the National Philanthropy Day Luncheon) talk about his experiences in engaging donors, including what sparks their interest, how they get engaged with particular causes and organizations, and what encourages them stay engaged. During this webinar, Derrick will guide you through what motivates Millennials to give to nonprofit organizations. He will discuss how to create customized campaigns and engagement programs to raise awareness and support from Millennials through online, direct mail, email, and event based approaches. As CEO, Derrick provides overall leadership for Achieve. He is responsible for providing strategy to clients, overseeing the creative development of client work, and leading the full execution of fundraising efforts for clients. He leads the research team on the Millennial Impact - a project to understand Millennial engagement in the nonprofit sector. When not working closely with Achieve clients, he is a speaker and author on the latest trends in fundraising, online engagement, and Millennials. Derrick is the author of Cause for Change - The How and Why of Millennial Nonprofit Engagement published by Jossey Bass. Meeting held from 11:00 am- 1:00 pm at the Mountain City Club.